A customer’s perceptions of the person behind the till can be very wide of the mark. Why, one’s mother had a shop for twelve years (yes, it runs in the blood), and her customers never differentiated between the morning lady (herself) and the afternoon lady (Doris, who was a good 6 inches taller). Sometimes familial relations betweem staff are assumed where none exist (“oh yes, I was talking to that man…Is he your son? Anyway he said…”). More often than not the customer simply doesn’t care who is behind the counter as long as there is someone there. There are currently three of us manning the tills at Persepolis. And one behind the scenes – but we’ve already met him here. Here’s your chance to get to know them. 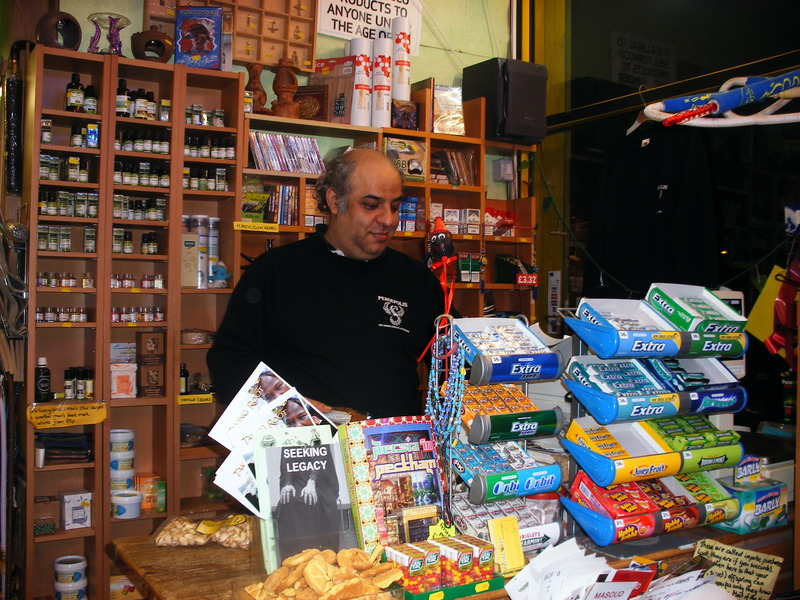 First up is Jamshid, aka Jamie, aka Mr. Shopkeeper…. Defining physical characteristics: well, tough one this. He used to be a lot cuddlier than he is now. A lack of follicular coverage is one feature, and he has twinkly hooded eyes. It has to be said that he does look very Persian. Often to be found: Trying to work out where he left his last cup of tea. Trying to persuade someone to make him a replacement cup of tea. Strutting round the shop making mental notes of things to tell Mrs. S. whilst she is making him a cup of tea. Doing a jolly little Persian dance when he thinks no-one is looking. On the phone trying to look like an executive (actually taking to his wholesale customers). Potted CV: Although he was born in Tehran, Mr. S.’ family actually come from Kermanshah in Western Iran. His accent will confuse you though, as he spent his teenage years being educated at (and expelled from) schools in France and Belgium. He is a maths prodigy, and the real brains behind the business – when he is allowed to have his way. He is a proud father/grandfather, although patently too young for the latter role. He is an averred carnivore, likes cheesy 80s pop music, and has a serious box set habit. Veggiestan has Landed. Or Rather: We’ve Landed in Veggiestan. Are We Your Favourite Corner Shop? Lovely profile of Mr Shopkeeper. My sister and I are always careful to enunciate clearly the ‘d’ at the end of his name, as he instructed.